Transportation Costs > How Much Does a Following Closely Ticket Cost? How Much Does a Following Closely Ticket Cost? 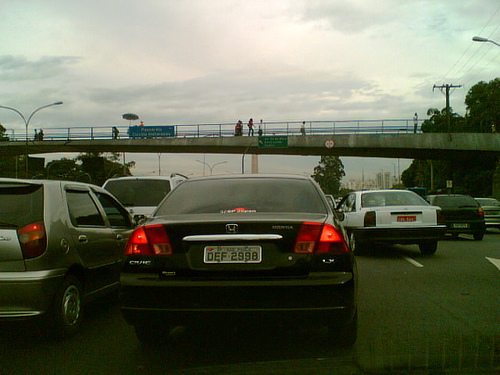 A following too closely ticket, also known as tailgating to most, is one of the most common causes of traffic accidents. According to the law, a driver following another vehicle has a duty to keep a safe distance. As a general rule, this reasonable distance is measured at two car lengths. How much does a following too closely ticket cost? On the average, the first offense of a “following too closely” traffic violation will be around $85 to $300 depending on the state you received the ticket, your driving record, and the trial judge. If it were a second or even third offense, then the costs could increase to as high as $90 to more than $500. With so many factors that can affect the costs, it can be hard to give an exact estimate. According to this forum thread on Reddit.com, they claimed a following too closely ticket in South Georgia will be about $125. Another person, who was located in Fulton County, said they had to pay $250. On this Avvo.com thread, someone asked about this type of ticket and said they had to pay $120. On the official website of Fairfax County, it says that when a motor vehicle is following another vehicle more closely than is reasonable or prudent, it is considered a “following too closely” violation and the fine for a first offense will be $92. $30 is for the basic fine and $62 is for the processing fee. In Clay County, Missouri, the total fine is $95. The City of New Orleans says a following too closely ticket will fall into the same category as the following violations: following too closely, improper starting/ backing, no registration, red light, stop sign, title transfer and no title, driving against traffic, failure to obey officer’s signal, and failure to yield. Each of these violations will impose a traffic violation fee of $212. Aside from the assessed fine, there are processing fees and court surcharges and costs for traffic violations, as permitted by laws of the state. Getting multiple traffic violation tickets over a short period will shoot up ticket prices, even if each ticket is given for a different offense. In New Orleans, violations that fall under a State Statute cost $20 more. These types of hidden fees may be charged in other states as well. As stated above, if the ticket follows through and you’re found guilty, then your insurance premiums will more than likely go up. Dismissing a ticket can be a challenge, and in some circumstances, especially if you have multiple violations on your record and can’t afford more points, then you may want to hire a traffic violation lawyer to help you fight a ticket. In this scenario, a good lawyer could cost $200 to $500 to help you work with the courts; however, a good lawyer will be able to help you receive the fewest points possible on your record. Any driver convicted of this traffic violation law will have this on his or her driver’s record if convicted. In some circumstances, you can also serve jail time, but this is rarely pursued, especially for first-time offenders. Depending on the state you received your violation, a points system may be used, and this type of ticket will usually be one or two points on a driving record. It is best to keep in mind to be at least one car lengths behind the car in front of you, except in select situations when this is not possible. There are circumstances wherein the traffic charges can be dismissed if the officer did not file the ticket within five business days from when it occurred. If the affidavit is defective and the officer only based it on hearsay, meaning he was not able to witness it for himself, you could have a better chance of getting the ticket waived. If there are procedural lapses on the part of the officer and you have a clean driving record, the court may dismiss the charge without a hearing. If you area able, try to get a court hearing rather than just paying the ticket through the mail or over the phone. If you appear before a judge and give an explanation of what happened, many positive things can happen. The officer may not show up at the court hearing, which means the ticket is thrown out completely. If the officer does show up, you can fight the ticket by trying to get out of it completely; if you succeed, the ticket will be thrown out. Lastly, you can simply admit the fault of the ticket and ask for no points to be put on your record. This means that you will have to pay the full amount for the ticket, but your driving record will not show any offenses. This means that your insurance company will not increase your premiums. Even if you go and end up paying and having your driving record marred, you will not lose anything by trying. Try to have your citation dismissed through procedural errors on the part of the prosecuting office if there are any committed. ExpertLaw.com has a guide on how to successfully fight a ticket like this one.